Did you know that digital screens could be damaging your children’s eyesight? Today, our kids grow up being surrounded by digital devices. And that means they’re heavily exposed to screens from a very young age while their eyes are still developing. So… what is blue light? Blue light is all around us. It is emitted by the sun as well as artificial sources, including digital screens like your smartphone, tablet or computer. Recent studies have shown that exposure to blue light causes damage to the retina. Our children’s eyes are not developed enough to protect itself from blue light and we don’t think it’s worth gambling our children’s eyesight on. 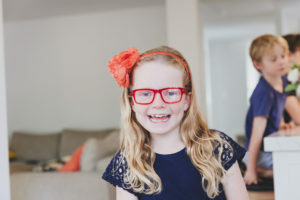 With BYOD programs now in all schools around Australia (including public high schools), children are spending even more time on their digital devices & our partners at Baxter Blue and ourselves at School Pride would like to help protect their eyes. Plus, in addition to the damage that the blue light is doing to our kids’ eyes, our teenagers are even more likely to use their devices at night, leading to sleep deprivation at a critical time for their development. We still don’t have definitive research on how blue light leads to macular degeneration, but we don’t think that it’s worth gambling our kids’ eyesight on. If they have been watching screens for 20 years, all day and all night, we suspect that there may be some damage down the road. Devices are here to stay… and Baxter Blue glasses are here to help! Our partners at Baxter Blue have developed a range of fashionable non-prescription eye glasses that filter out the dangerous blue violet light. Their goal is to give every child on a digital device, access to computer eyewear to protect their precious eyes. Click here to learn more about the effects of blue light. 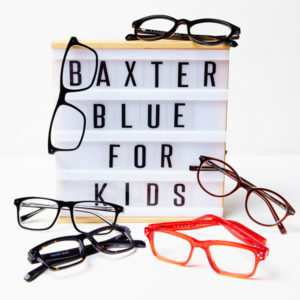 To see the full range of Baxter Blue glasses for kids… let’s go!